Now Wi-Fi. Enjoy our NEWLY constructed lodge style vacation cabin situated in a peaceful setting of cedars, vine maples, and wide open spaces. Outdoor activities abound being 15-20 miles between the beautiful Bavarian town of Leavenworth and Stevens Pass Ski Resort. Fishing at Fish Lake (boat rentals available) and splashing beachside at Lake Wenatchee State Park are also just a few minutes away. Either way, your family will love creating these lasting memories. Cabin amenities ensure a relaxing and entertaining stay. From our oversized front porch with breathtaking view of Dirty Face Mountain and cozy gas fireplace; to the entertainment loft with 37' flat screen TV, video and game library; there's something for everyone! Enjoy winding down after a day of the beach, rafting the river, hiking, and/or skiing. The kids especially like! Our family resides just outside of Seattle, WA and has always enjoyed hiking, fishing, camping, and snow. Especially the snow part. We also enjoy traveling and visiting relatives in Europe so have also tried to incorporate some of the quality, comfort, and airiness from our favorite places in Germany and Austria wherever possible. 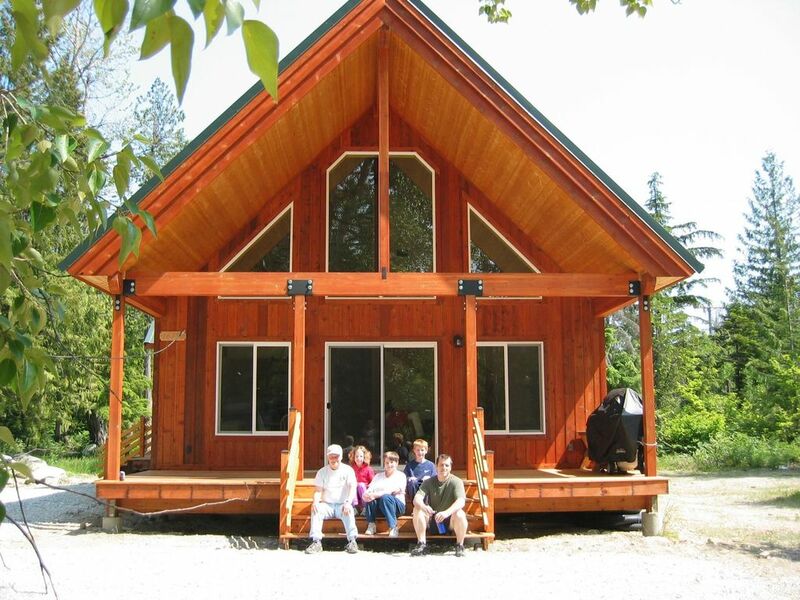 We built our vacation cabin about 4 years ago in the heart of this huge outdoor recreational area, situated halfway between Leavenworth and Steven's Pass Ski Resort. Minutes from Lake Wenatchee and Fish Lake. The 2 hr. commute from Seattle to the cabin makes it especially easy to get away and enjoy some sun and hotter dryer weather during Seattle's spring and early summer. As much as we enjoy the property in the summer, one of our favorite winter memories was of fantastic skiing with the kiddos and friends; Leavenworth site seeing and wine tasting; and innertubing Ski Hill. Especially during cabin downtime, smile thinking about not being able to pull the kiddos away from their snowforts, dads enjoying football and XBox, and moms enjoying books, walks and the hot tub. Throw in a snow ball fight and good game of cards... Overall, it is a getaway that is easy to enjoy. Even for grandparents and families with a loaded down minivan. Unload in minutes and start that vacation! The wide and 'L' shaped driveway makes for ample level parking for multiple vehicles, boats and boat/snowmobile trailers. Our favorite spring ritual is hiking up the Dirty Face Mountain trailhead just behind the Ranger Station (1-2 mins. away). Wild flowers, waterfall, and incredible view! Of course the Hidden Lake hike is a must do as well. Grandma and Grandpa gave it their two thumbs up. So much to do all within 1 minute to 25 minutes away that you can't do it all. You can't. But you'll definitely have fun trying. Magical Place! Snow or sunshine, this is the place! We stayed during Christmas! It was wonderful. The house comfy, decorated nicely and had enough room for the 5 of us. The TV is located in the loft upstairs which left it quite nice in the kitchen to cook without the blasting of the TV. The neighbors are friendly and nice. There is sledding at the Lake Wenatchee State Park, South entrance. They have a huge hill that is packed and ready to sled on. We rented snowmobiles. Next time we will try the cross country skiing at the town of Plain (great gift shop and espresso there). Plain is on your way to Leavenworth from cabin if your not taking the hwy. Highly recommend! Very comfy cabin in a great location. Perfect for a family! We really enjoyed our stay and had a great experience. * Spacious family/common area downstairs + an upstairs area for the kids to play. The common area/interior is a larger than the photos suggest. * Close to Stevens Pass for skiing. * Good kitchen setup for cooking. * Far enough out from Leavenworth to relax, yet close enough to go into town. Very nice cabin in the woods. Clean and inviting. Stocked with everything we needed. Excellent place to stay with a group of friends or large family. Sleeps up to 10 comfortably. Clean and inviting. About 30 minutes to Leavenworth. Right off of the highway for easy access even in the snow. The property is very nice and the cabin is new and clean. Unfortunately the owners didn't turn on the heat before we arrived and the house wasn't comfortable until the next day.